Willliam BLAIR (1781 – 1875) was Alex’s 4th Great Grandfather; one of 32 in this generation and the founder of our Blair line in North America. There are still BLAIRs in Franklin, Quebec who operate a Sugar Bush. I’ve heard their maple syrup is delicious!!! William Blair was born about 1781 in County Armagh, Ireland. His parents may have been William BLAIR Sr and Mary [__?__]. 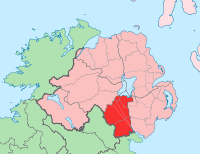 He told people he was from Armagh – no town, no parish, no townland – there are over 500 parishes in Armagh so it’s hard to find the correct one. The local Gleaner Newspaper stated that 07-31-1875 William Blair Sr., died at Franklin Que., on 31 July 1875 Aged 95 attesting to the early date of birth is correct. If the early date is correct, he was 42 when he married, 49 when he immigrated and 62 when his last child was born. William was recorded to be 65 years old in the 1852 census giving a birth date of about 1787. According to Sher Leetooze, William first married Betsey Grimshaw in about 1803 in upper New York State. 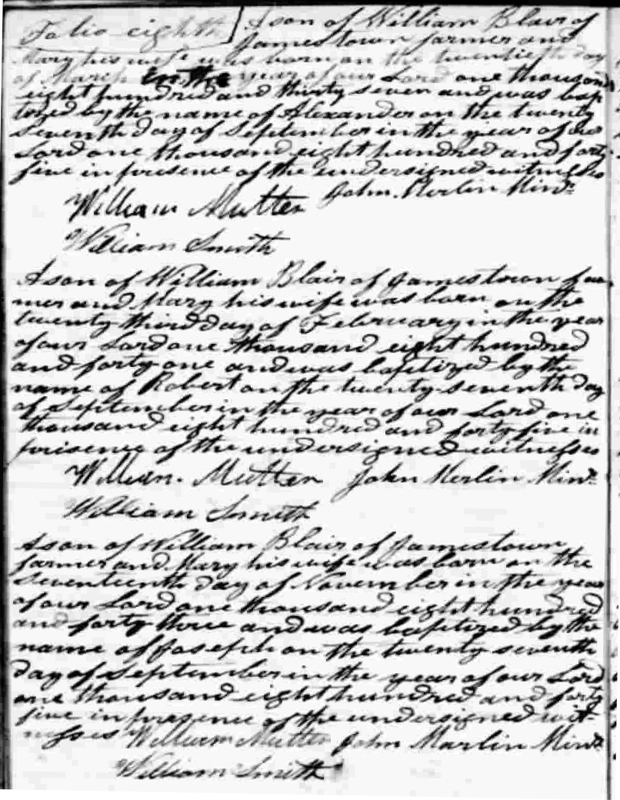 According to a couple ancestry.com family trees, William and Betsy were married 5 Oct 1800 in Haverhill, New Hampshire. Betsy’s parents were William GRIMSHAW (1765 England – ) and Elizabeth Zephaniah (1765 – ). Members of both Blair and Grimshaw families kept moving back and forth across the border between Quebec and New York all down through the years that followed. Sher thinks William Blair went home to Ireland and theorizes he had already been on the land at an early date, then gave it to his brother when he went back to Ireland. The lot that his brother Thomas Blair settled on with his young family was one lot over from William Blair’s father-in-law! Sher thinks William’s wife died and he went back to Ireland. He did eventually return with a new wife and five children, but not until the 1830’s. William married Mary HUESTON Sep 1822 in Ireland. He came with wife and four small children from Armagh County, Ireland, in the spring of 1830. Mary was only a few weeks old. They visited with relatives before moving to Frontier, New York, just across the border from Canada. In 1837 they moved to Franklin Township, Quebec and got a farm of 200 aces, most all it it well timbered, clears a piece and built a home for themselves. William died 31 July 1875 at Franklin Center Quebec in his 96th year. Mary Hueston (Huston) was born about 1796 in Armagh County, Ireland. Mary remained in the home until the house was destroyed by fire in April 1883. She then went to live with her youngest son Joseph. Mary died 6 Oct 1887 in Jamestown, Quebec aged 91. Mary was recorded to be 52 years old in the 1852 census giving her a birth date of about 1799. There are many Blairs still living around Franklin Center today. In front of the Blair sign, in Franklin are the present Blair family members who run an apple/maple syrup operation. 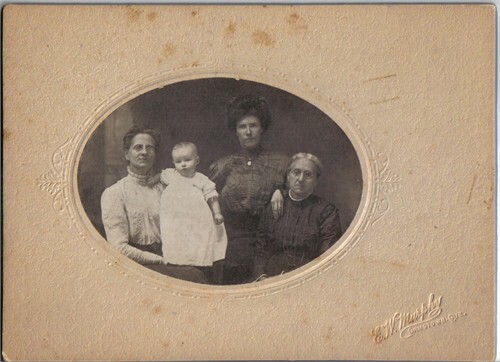 The people in the photo are all descendants of Lewis Blair. The Lewis Blair Farm and the Clarence Blair farm are side by side and all their sons built homes right across from the original farms and continued on in the family business. It is on the original Blair farm since the 1800s and they are all our cousins. The raise beef cattle, have thousands of apple trees and maple trees, dairy cows and have an excellent business. The cows are always there, with the syrup in the month of March and the apples in August thru til November. That was and still is the whole business of the Blair family. . They make 500 pies, of every variety (mostly apple) every week and are baking on Sunday as the 500 pies are all gone. They make bread, buns, donuts, etc. and have a tea room which opens in August and closes on 31 October. It is all family run by all the sons, daughters, cousins, etc. A great Blair family business! A cousin also runs a trucking company – Blair Transport — out to Vancouver with apples and stop in Calgary to pick up meat for Steinberg’s Grocery Store on the way back. They are on the road all week out to Vancouver and down through the States, another side of the same Blair family. William Blair and Mary Hueston were married September 1822. 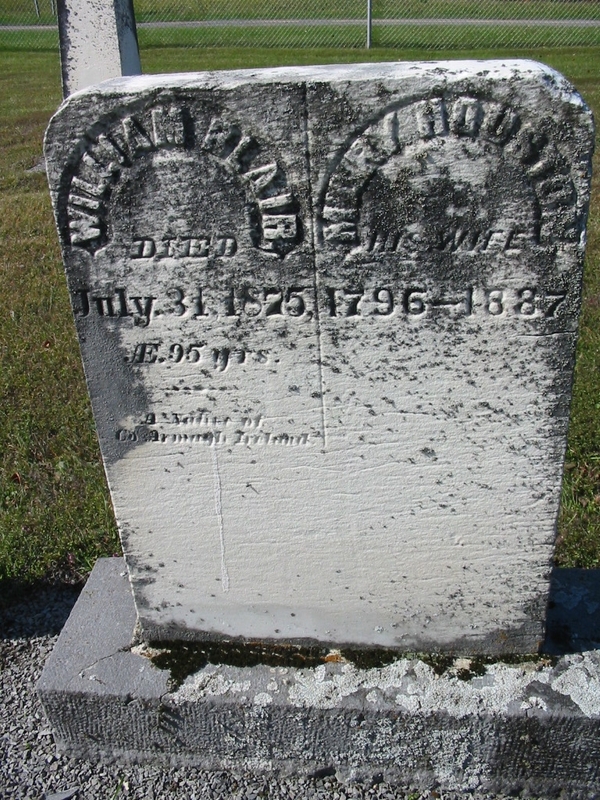 He was born in 1781 and died July 31, 1875. 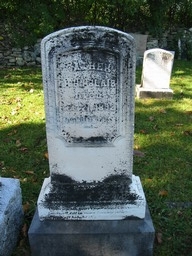 Mary Hueston Blair was born in April 1796 and died October 6, 1887. They left their native land, Armagh Co. Ireland, with their small children, have heard the fourth child, Mary was born on their way out to this country. They left the old land very early in the year and after a hard trip of a number of weeks, ( I think 10), arrived in Montreal, Canada in the Spring of 1830. After a short visit with relatives (his brother and 3 children, I think, who lived in what is called now Hinchinbrook), he moved his family to Frontier, N.Y. just across the border. He was a weaver by trade in his homeland and of the Quaker belief, also was left-handed. In Spring of 1837, they moved to Russelltown, Township, now known as Franklin Township, Huntingdon County, Quebec. He got a farm of 200 acres, most of it well timbered, cleared a piece of ground and built a home for themselves. The early pioneers had a great many hardships that we of our day know nothing about. He made a success of farming and spent the rest of his life on the farm, and died in his ninety-fifth year. His wife was a faithful companion and did her part faithfully. She remained in the home until the house was destroyed by fire in April, 1883. She then went to live with her youngest son and died in her ninety- second year. Their family of seven sons were all farmers and their two daughters married farmers. Seven of the family married and settled in Franklin Township, Quebec. One son in the Province of Ontario and one in Mass., U.S.A. They were a strong and healthy family, the last one passing away on December 24, 1932 to the Great Beyond. 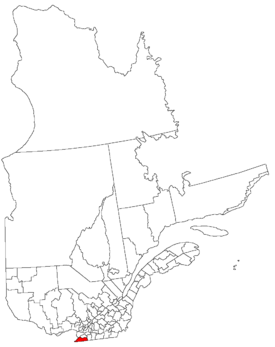 The Grandchildren are scattered far and near, some in th Province of Onatario, Province of Quebec, and several in the United States, also in the North West. All are busy and enjoying life in such a different way from that of their Grandparents. We are unable to imagine what this world will be like in another 100 years, if it changes half as much as it has in the last. 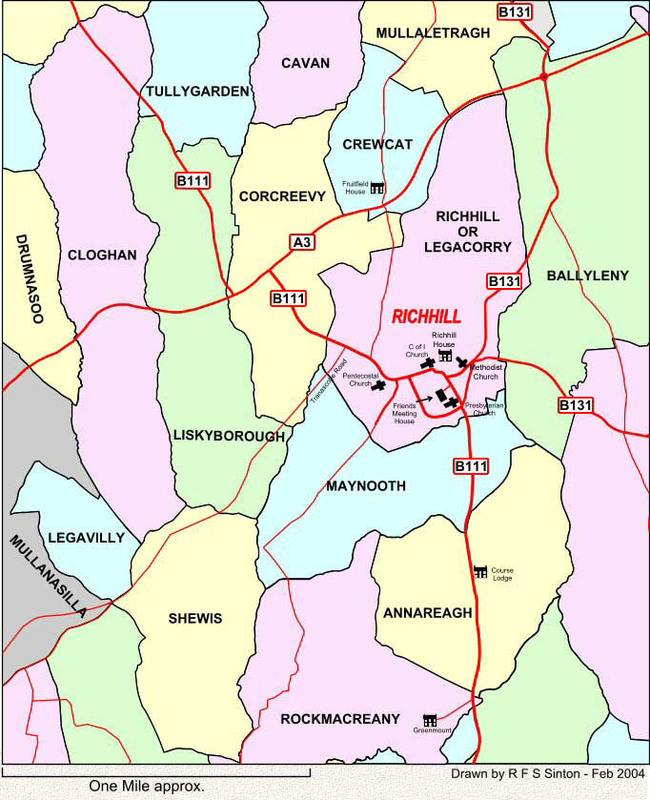 or near Richhill, though if they married in her family parish I haven’t a clue where that would have been – I can’t find her anywhere. Hopefully, the Banns were read in both parishes and I can find her through his parish (if it is indeed Richhill/Kilmore). Hopefully someone has access to records and can assist me to prove my suspicions. Many thanks for any help anyone can offer. This is what I thought I knew….. Assumed William and Mary BLAIR, died at Richhill Parish 1822 to be his parents – right place, right age….. because he was both a weaver and a Quaker it was a nice neat package to place him at Richhill where the Richardson’s had built a Quaker meeting house in about 1803 and where they owned many townlands and rented cottages to weavers, and had a linen agent who collected from them. On the 1796 Spinning Wheel Premium List, William and Mary Sr. are listed as weavers at Mullabrack, just the right age, then by the time the Richardson’s had built their meeting house these same two people were a few miles away at Richhill and are buried there. > 1st son – named for father’s father….so, their first son was born in 1823 and named John – that puts the above information to rest, doesn’t it!!! > 3rd son named for father – well, the father was William, so the second son of our records must be, in actual fact, the third son – I need to find a death in 1824 or 1825 of a child. > 4th son is named for eldest brother of father – this fits – the next son is indeed Thomas, and William’s elder brother Thomas did indeed emigrate to Quebec as well. Thomas’s eldest son was called John, just like William’s, so I guess I have to look for a John?! it to be a distant relative. Unfortunately, the Tithe Applottment index does not give an occupation. > As far as being a Quaker, the Lisburn Meeting says he never paid subscription – that he likely attended meetings in sympathy for the Friends. He and his wife were Methodists once they arrived in Quebec, Canada. 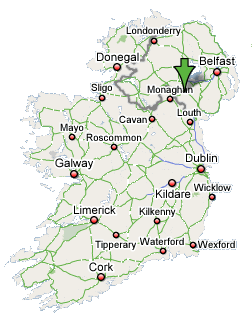 > None of the records here in Canada say what part of Armagh they came from, simply Armagh, or just Ireland. > Also, John Hayes, on his website, has transcribed the 1848-63 Griffith’s Valuation and there is a James BLAIR at both Iskemeadow and Tullynamaloge townlands – could be a brother who never came to Canada. Does anyone know if the 1825 has occupation, or any other information? Would it be worthwhile to spend the $6 to order the film into my local LDS FHC?? William was a weaver by trade, and a Quaker, Alternatively, he was a farmer, and all the children also became farmers. In the 1852 census, all William and Mary’s children were recorded as living at home, except the eldest, John, recorded one household away with his wife Betsy McAvoy and daughter Jane. 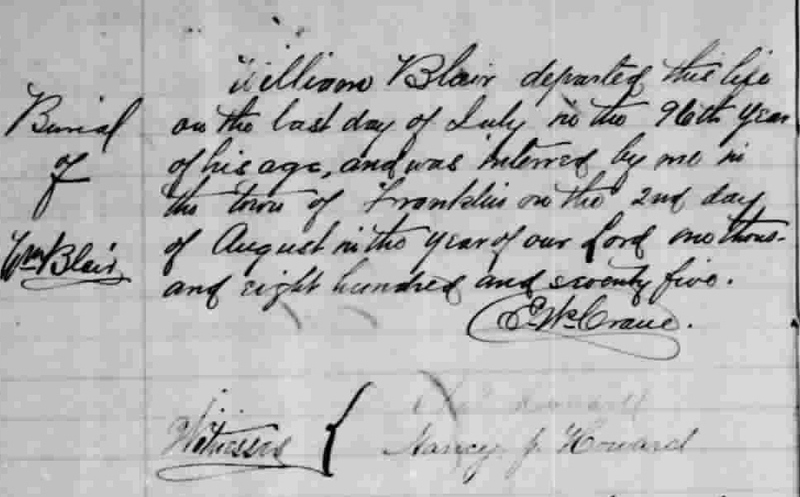 07-31-1875 William Blair Sr., died at Franklin Que., Aged 95 years. Deceased was a native of the County Armagh, Ireland. 10-06-1887 Mary Hueston, relict of the late William Blair, died at Jamestown Quebec, age 91 years 06 months. Deceased was a native of County, Armagh Ireland. William Blair of Jamestown baptized Alexander, Robert, and Joseph all on the same day, 27 Sep 1845 in the Hemmingford Presbyterian Church. The day before, his cousin William of Hinchinbrooke baptized his son Daniel and his cousin John of Hinchinbrooke baptized his daughter Samantha Jane at the same church 26 Sep 1845. John’s first wife Betsy McEvoy (McAvoy) was born about 1826. Betsy died 10 Oct 1856 in Russelltown (Methodist Church and Presbyterian Church), Québec. John’s second wife Mary Jane Smith was born about 1828 in Tallington, Lincolnshire, England. Her parents were William Smith and Mary [__?__]. After John died 21 May 1892, after a very brief illness at Franklin Center Quebec, age 69 years, Mary Jane married Daniel Parham Sr 16 Nov 1895 at Franklin Center PQ, at the bride’s residence, by Rev. J. L. Brown. Mary Jane died 5 Aug 1924 in Franklin Center, Quebec, Canada. Otis enlisted in Company A, Massachusetts 3rd Cavalry Regiment on 25 Feb 1864. He was promoted to Full Hospital Steward on 26 Jul 1864. Mustered out on 28 Sep 1864. According to Civil War records, he was 18 when he enlisted, meaning he was born in 1846 instead of 1848. Maybe he was only 16. In the 1900 census, Otis, Mary J and their son Oliver were living in Kansas City Ward 6, Wyandotte, Kansas where Otis was a druggist. 1912 Kansas Cyclopedia – Oliver Quincy Claflin of Kansas City, Kan., is a young lawyer of fine ability who entered the profession well equipped for advancement. He is a native Kansan, having been born at Chanute, Neosho county, July 4, 1881, a son of Otis Claflin, who is now a druggist in Kansas City, Kan. The father was born at Haverhill, Mass., Feb. 29, 1848, and gave his services to the Union during the latter part of the great civil war. At the close of the war he came to Kansas and first located at Kiowa, later removed to Chanute, Girard, Ottawa and thence to Kansas City, Kan., in 1887. He married Mary Jane Blair, who was born in the Province of Quebec, Canada. She too is living. The Claflin family is an old and prominent one in Massachusetts history, one of its members having been Governor Claflin of that state, known as the war governor, who held that office during the Civil war. It is a Revolutionary family, also. Oliver Q. Claflin was six years old when his parents removed to Kansas City, Kan., from Ottawa. He completed the sophomore year in the Kansas City, Kan., schools and in 1900 graduated from the high school of Kansas City, Mo. In the fall of 1900 he entered the University of Kansas in which he spent four years pursuing the study of pharmacy and law in addition to the regular course. He was graduated in the law department in 1904 with the degree of Doctor of Laws and won the Edward Thompson prize. He at once began the practice of his profession in Kansas City, Kan., where he has since continued. For one year he was the partner of T. A. Pollock after which for two years he was associated with the law firm of McFadden & Morris. Upon the death of Mr. Morris, in 1907, he became the partner of J. E. McFadden, with whom he is still associated. iv. Nancy Blair (11 Mar 1864 – 2 May 1886 at Franklin Center, PQ ); m. 11 Jun 1885 to Robert M. Tannahill (17 Feb 1857 – ) at the residence of the bride’s father, in Franklin Quebec, by Rev. Mr. Wilkinson. v. Albert Blair ( 1 Feb 1866 Franklin Center, PQ- 9 Nov 1931 at Montreal, PQ, Interred at Franklin Center PQ.) m. 9 Jul 1890 to Idia Towns (1861 – 13 Jan 1949, Franklin Center PQ). Albert leaves to mourn his loss, his wife, one brother, Mr. Henry Blair, one sister, Mrs. George Brooks, 10 nephews and four nieces. Funeral service was conducted at Black’s United Church, by Rev. T. F. Duncan. Interred in Black’s Cemetery. vi. Henry Blair (23 Mar 1868 – 1952) m. 3 Jun 1891 at Hinchinbrook to Minnie Blair (1871-1953) at the residence of the bride’s father, by the Rev. James O’Hara, Ormstown.. Minnie was the daughter of William Isaac Blair. 06-26-1918 Isabelle Jennie, married Mr. James G. Lamb, at the home of Mr. and Mrs. Henry Blair, Sunnyside Farm, Franklin Center PQ, by Rev. H. Allenby, officiating. William’s wife Hannah Adelia Morrison was born about 1835 in Wells, Hamilton, New York . Her parents were Isaiah Morrison (1817-1873) and Clara (Clarissa) Brown (1804-1865). Adelia died 10 Apr 1931. 05-19-1904 William Blair, died at Franklin Center PQ, aged 79 years. Deceased was a native of Armagh, Ireland, and came to this country when he was 04 years old. 04-10-1931 Adelia Morrison, Widow of the late William Blair, died at Franklin Center PQ, age 96 years. Interred at Franklin Center Cemetery. She was the daughter of Isaiah Morrison and Clara Brown, she was born in Wells New York, and married William Blair of Franklin center PQ, in 1857. Predeceased by her husband 27 years ago. She leaves to mourn her loss three daughters, Clara, Mrs. T. A. Hanna of Ormstown PQ, Mary Emma, Mrs. William Hanna and Hettie, Mrs. Alexander Blair, both of Franklin Center, three grandchildren 11 great grandchildren, and one great great grandson. Funeral service set Franklin United Church by Rev. T. F. Duncan. ii. Clarissa (Clara) A Blair (Jun 1861 in Franklin Center, Quebec, – 11 Dec 1937 in Ormstown, , Quebec) m. 1 Jan 1885 to Thomas Andrew Hanna (1 Dec 1861 – 24 Apr 1925) at the residence of the bride’s father, in Franklin PQ, by Rev. Mr. Wilkinson. iii. Mary Emma Blair (10 Feb 1864 Franklin Center, PQ – 11 Dec 1948 Valleyfield (Greffe de Valleyfield) Québec) m. William Hanna 8 Jul 1885 at the residence of the bride’s father, in Franklin Center, by Rev. Isaac Wilkinson. Charlotte Olive McMillan The Child, Mildred Mae Mcmillan standing up in back Emma Blair Hanna sitting on Left side Adelia Blair seated on Rt. side. They had a son Roy J Blair b. 5 Jul 1889; m. 17 Sep 1919 to Nellie May Grimes (b. 4 Apr 1893) who lived in the original Blair family home built in 1840. Still living there when my grandparents visited them in their post-retirement trip. Jane’s husband Benjamin Johnston was born Mar 1822. 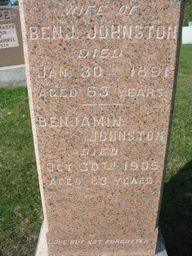 Benjamin died 30 Oct 1905 in Franklin Centre, Quebec. 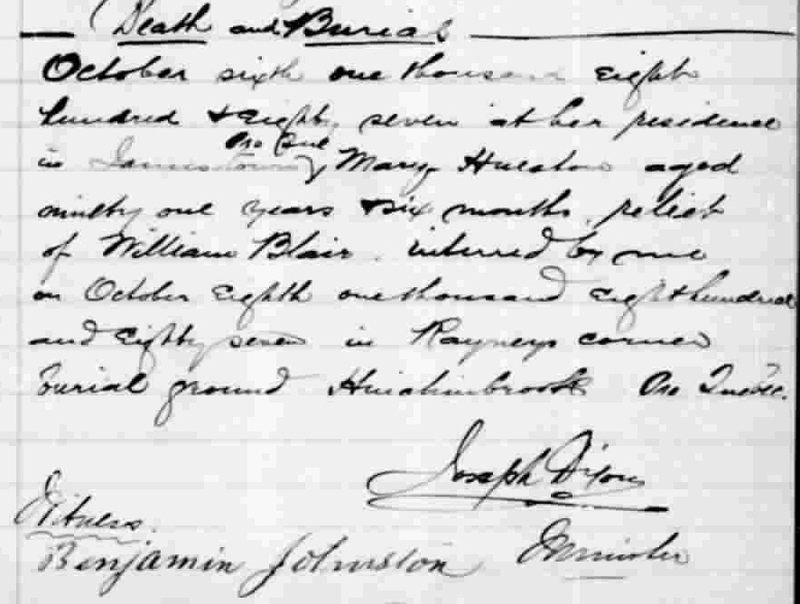 Jane married 30 Apr 1855 at the Congregational Church in Russelltown Canada East to Benjamin Johnston Witnesses: Benjamin Johnston, Jane Johnston, Jane Johnston, and Alexander Blair. Jane witnessed the birth of her son Thomas with an “x”. 01-30-1891 Jane Blair, wife of Benjamin Johnson [Johnston], died at Franklin Quebec, age 64 years. i. Mary Elizabeth Johnston b. 8 Sep 1854 – 3 May 1943); m. 12 May 1886 to John Francis Angell (22 Jun 1858 – 9 Jan 1899) of Valleyfield Québec. She was predeceased by her husband, the late John Francis Angell, in 1899, and by a son, Harry, who drowned in Valleyfield in 1896. died at her residence, 4620 Esplande Avenue, Montreal Québec, she is survived by one son, John B. Angelle of Montreal, and by a daughter, Mrs. Alice Baskin of Ormstown Québec, also by four grandchildren, Mr. B. M. Johnson of Franklin Center is a brother. Funeral service from the Chapel of D.A. Collins, on Sherbrooke Street West in Montreal, service conducted by the Rev. C. Richie Bell. Interment in Valleyfield Québec. iii. Benjamin M. Johnston (? – Aft 1943 of Franklin Center); m. 21 Jun 1893 to Bertha Elizabeth Gilmore, of Russeltown PQ. At the residence of the bride’s father, by that Rev. N. Waddell, B.D. of Lachute. iv. Eliza Jane Johnston (2nd daughter of of Benjamin Johnston, Esq., of Rockburn PQ – After 1891 ) m. 22 Nov 1882 to Henry Franklin Rowe (1858 Canada – After 1930) of Franklin at the residence of the bride’s father, by Rev. William A. Johnston, of Rockburn. In 1904, Henry of Valleyfield, married Mrs. Sadie Woods, of Ellenburgh New York. They immigrated to the United States in Oct 1919. In the 1920 and 1930 census, Henry was a general carpenter in Malone, Franklin, New York. He was married to Sadie Woolds who was 14 years younger and probably Henry’s second wife. Mary’s first husband William Smith was born in 1814 or 1815. William died 16 May 1901) Aged 86 years and 11 months; died at his home; Buried at Franklin Witnesses: Gentle, William; Parham, D. N.Church: Congregational Church at Franklin Centre, Québec. Mary’s second husband Prentice L. Jenkins was born in 1830. Prentice died 25 Sep 1902, shortly after his marriage to Mary in 1902. Aged: Groom, 73; Bride, 73; At home of bride’s brother Congregational Church at Franklin Centre, Québec. James’ wife Samantha Ann Grimshaw was born 29 Oct 1839, Wolfe Island, Frontenac, Ontario Samantha was probably James 2nd cousin, see above. Her parents were William Grimshaw (Abt 1812 – 07 Dec1897) and Mary Ann Blair (Abt 1813 – 06 Nov 1883) Samantha died 26 Apr 1883, Pittsburg Township, Frontenac, Ontario. That Arni Merchant Lewis, on the 27th day of September, 1863, in the State of New York, county of Jefferson, township of Cape Vincent, joined together, in the Holy Estate of Matrimony, James Blair & S. Ann Grimshw according to the custom of the Protestant Episcopal Church, in the United States of America. -Minister of St. John’s Parish, Cape Vincent, Jeff Co., N. Rf. Dated, Cape Vincent, Sept. 27, 1863.
i. Helen Mary Blair (25 Nov 1864, Wolfe Island, Frontenac, ON – 16 May 1905 Kingston, Frontenac, ON); m. 13 May 1886 in Kingston, Frontenac, Ontario to John Francis Reynolds (07 Dec 1864 Kingston, Ontario – 02 Aug 1935 Kingston, Ontario) His parents were Samuel Reynolds and Ann Clayton. ii. William John Blair (20 Nov 1866 , Wolfe Island, Frontenac, ON – 07 Feb 1952 Toronto); m. 07 May 1889 in Kingston, Frontenac Co., ON to Mary “Minnie” Waddingham (30 Jul 1873 in Kingston, Ontario – 19 April 1925 in Oshawa, Durham. Ontario) Her parents were Thomas Waddingham and Elizabeth Reynolds. Ida immigrated in 1892. In the 1910 census Ida J and Neil lived in Groton, Connecticut where Neil worked in a quarry. Alexander’s wife Lizzie Anthony was born 04 Aug 1843 – Huntingdon, Quebec. Her parents were Francis Anthony and Mary Stewart. Elizabeth died 6 Jun 1919 at Franklin Center PQ, age 75 years 10 months. 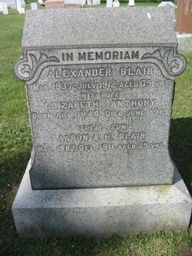 07-15-1912 Alexander Blair Sr., died at Franklin Center PQ, aged 75 years 03 months. Robert’s wife Emily Augusta Woodman was born 16 Aug 1839 in Raymond, Rockingham, NH. Her parents were Levi S Woodman and Joanne C Nute. Emily died between the 1910 and 1920 census. A Robert M Blair, age 21, enlisted as a Seaman in the US Navy on 11 May 1862 in Boston, Mass. Service Record: Enlisted in the UN Navy on 05 Nov 1862. He mustered out on 31 Dec 1863. He married Emily Augusta Woodman in 1867. Emily and both her parents were all born in New Hampshire. In the 1880 census, Robert was a farmer living with his mother-in-law in Newton, Rockingham, New Hampshire. Robert always stated that his parents were born in Scotland on his 1880, 1900, 1910 and 1920 census forms. Emily was enumerated with HOH widowed mother Joann C Woodman; husband Robert Blair & children Alvira & Athol; sister, Lilla and her husband and son, Morris & Carl Moore. In the 1920 census, Robert was a widower living with his son in Haverhill. His immigration is back to 1860. In the 1910 census, Athol was a shoemaker in Haverhill Ward 5, Essex, Mass. Joseph’s wife Mary Cowan was born 23 Feb 1858. Mary, formerly of Franklin Center PQ, died in Montreal on 16 Feb 1942 Interred Feb 19, 1942 age 85 years. Joseph Blair, died 24 Dec 1932 at Franklin Center PQ, age 89 years. He was the last surviving son of the late William Blair, a native of Ireland. Funeral was held in the Franklin United Church and conducted by Rev. W. Ross, assisted by Rev. Mr. Duncan. Remains were taken to the Rennie United Church, and burial to place in Hillside Cemetery. This entry was posted in -6th Generation, 90+, Dissenter, Immigrant - North America, Immigrant - Scot-Irish, Line - Blair, Storied and tagged County Armagh, Franklin Center Quebec. Bookmark the permalink.